Executive Vice Chairman Hyun-man Choi of Mirae Asset Daewoo Co., Ltd. and President Mooyoung Jung of UNIST are posing for a portrait at the signing ceremony for cooperation MOU. The signing ceremony of MOU between UNIST and Mirae Asset Daewoo took place on May 30, 2018. 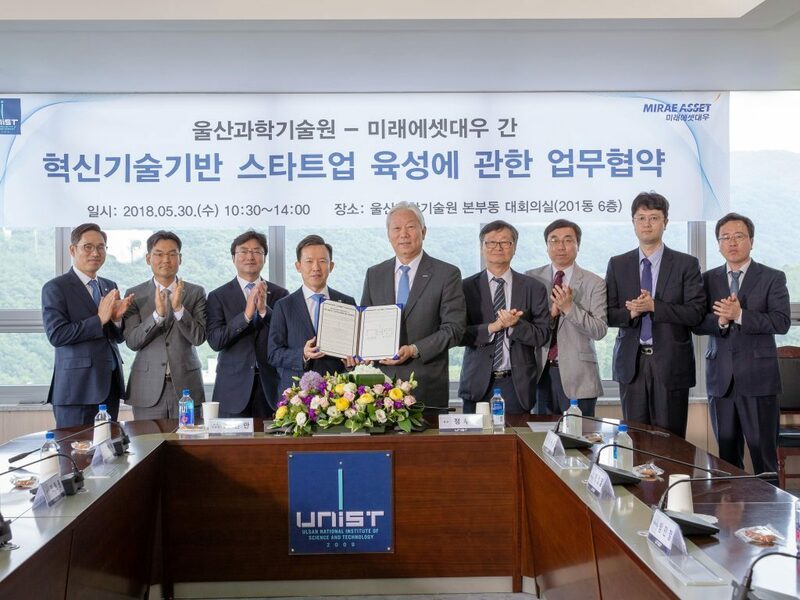 On May 30, UNIST signed a Memorandum of Understanding (MoU) with Mirae Asset Daewoo Co., Ltd. to accelerate their efforts to nurture innovative technology-based new ventures. In the memorandum of understanding, the two organizations also promised to form a strategic partnerships to help identify and nurture promising startups. Under this partnership, UNIST will take the leading role in activating innovative technology-based new ventures and Mirae Asset Daewoo will provide new age entrepreneurs with financial and technical assistance, as well as mentorship for the startups. UNIST has established various networks with startup accelerators and venture capital firms to find future profitable growth engines for promising tech startups. Through this, the joint technology holding companies of UNIST, which include Sunbo Angel Partners and Mirae Holdings Ltd. are residing on campus and provide all the necessary services dedicated to developing entrepreneurial skills and providing tailored support for early-stage startups. 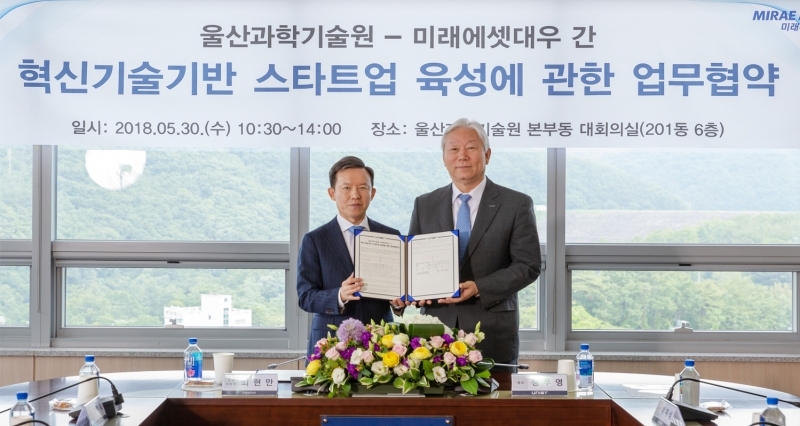 This partnership with Mirae Asset Daewoo will be of great help to UNIST, especially in attracting investor-linked sequential foreign investments, such as direct investments, venture capital, and private equity investments for the early-stage startups. Mirae Asset Daewoo has a comprehensive financial consulting system that can support the growth of the company in line with the life cycle of the company. UNIST anticipates that this agreement will help establish a virtuous circle of entrepreneurial capital for innovative tech-based startups. This is to build a structure that leads to “Investment-Recovery-Reinvestment” with UNIST as the center, thereby laying the foundation for new age entrepreneurs to nourish themselves. In addition, it aims to nurture global hidden champions and attract high-quality human resources. The ceremony has been attended by President Mooyoung Jung of UNIST, Vice President Jae Sung Lee of Research Affairs, Professor Sung Chul Bae (Director of UNIST Academy-Industry Research Corporation), Professor In Cheol Bang (Dean of Planning and Research), Executive Vice Chairman Hyun-man Choi of Mirae Asset Daewoo Co., Ltd., and Director Joon Hyuk Choi of Daegu-Gyeongbuk Branch of Mirae Asset Daewoo.